To those of us who support WLAN environments, the only constant is change. I’ve been getting both an eye and earful of those changes over the last week. As we all get comfortable with packet capture in 11ac Wave 1 (but start readying ourselves for Wave 2), we have some truths to face about the impact of more streams on what we’re used to doing for Wi-Fi analysis. And… as we get used to to using mobile devices for more networky-style tasks, it’s reasonable to want to take some of our preferred support tools in that direction. Alas, mobile devices will be practically limited to spectrum views and some degree of measuring the client experience, but don’t have much chance of doing much for us in the packet analysis realm. End of the road for portable WLAN packet capture? I had the pleasure of sitting in on Wireless Field Day 7 sessions at both Wild Packets and Fluke Networks this week, and the talk about 11ac packet capture was hot at both vendors. Both vendors talked about the importance of capturing 3×3 wireless traffic and their abilities to do so, but the difficulties can’t be glossed over. In fact, at Wild Packets, it was mentioned that “we’re getting close to the end of what we’ll be able to do with portable wireless packet capture off of laptops” because of adapter limitations and processing horsepower needed for complex multi-stream, multi-channel wireless environments. We were reminded by Wild Packets that capturing from APs has advantages, and APs can function as a big-honkin’ adapter in their own right when you need them to. 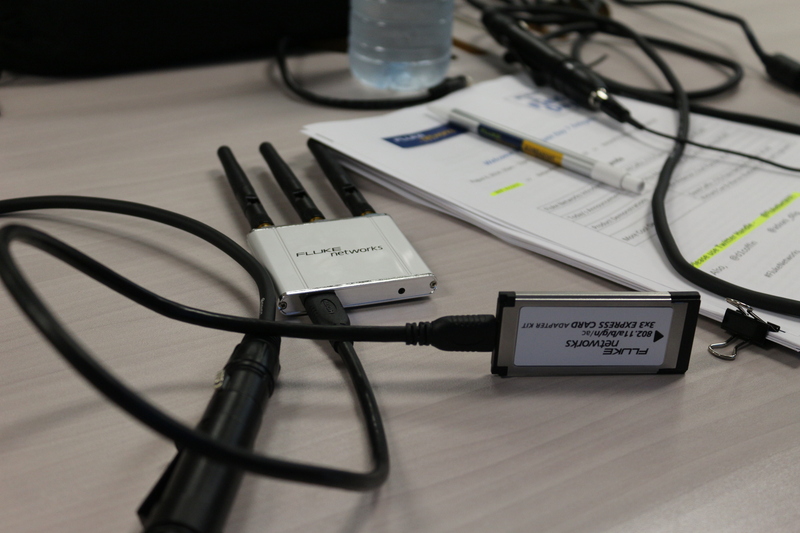 At Fluke Networks, new capabilities for 3×3 packet capture by Air Magnet was announced, along with a curious new adapter to facilitate the process. The express-card form factor of the AM C1097 was greeted with surprise (and a little skepticism) by Field Day delegates, but we also heard good news in that it is built on the same Broadcom 43460 3×3 adapter that is native to the latest Macbook Pro laptops. It was also made clear that “you gotta start somewhere” and since there are no USB 3×3 adapters yet, Fluke Networks did what they have to do in getting started with 3×3 support. Good stuff all around as 11ac gets more traction at a faster rate than was predicted before the standard was ratified. We can pretty much forget about practical or effective packet capture on mobile devices- it ain’t happening. At the same time, tablets and smartphones have some value when it comes to spectrum analysis and quantifying the client experience. Here, it all comes down to price versus effectiveness in mastering the small screen. Read my commentary on migrating wireless tools to mobile devices here, at my Network Computing blog. This entry was posted in Wireless Networking and tagged 3x3 packet capture, Air Magnet, Broadcom 43460, Fluke Networks, Lee Badman, Network Computing, WFD7, Wild Packets, wirednot, Wireless Field Day 7 on August 9, 2014 by wirednot.